Spring equipment: Get spring equipment into good shape for winter storage by cleaning every piece. Equipment also needs working spark plugs and belts, fresh oil, and sharp blades to perform well in the spring. Drain fuel tanks of lawnmowers and tillers. After being cleaned and sharpened, store garden tools in dry areas. Christmas tree selection: All set for an indoor or outdoor Christmas tree? Look for signs of a fresh, perfect tree for the holidays, including firm needles that bend instead of snapping. Another indicator is a moist stump that may be secreting sap. Holiday plant maintenance: Encourage a Christmas tree to absorb the impressive amounts of water it needs by cutting two inches off of the base of its stump after you bring it home. In 24 hours, an evergreen can go through a gallon of water, so dunk the trunk in a bucket of water next. Keep the tree hydrated by checking and refilling its stand twice per day. Once Christmas cacti start to produce buds, they don’t need to be watered or fertilized as often. 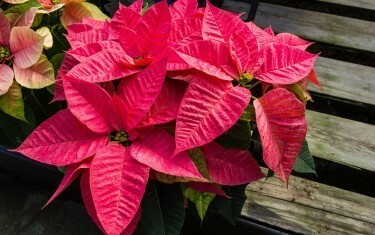 Festive poinsettias remain colorful if placed in temperate rooms that get no hotter than 70°F and no colder than 65°F. Water until soil is moist, but stop before it gets soggy. Winter plant shopping: Be cautious when transporting new plants home this winter. Houseplants suffer when left out too long in temps lower than 50°F. Paper and plastic materials, such as sacks or sleeves, protect plants from the elements, so take or request some when shopping. Care for new purchases by taking them directly home and draining water to prevent root rot. Houseplants: Now that you have new plants to keep your home vibrant during the winter, do what you can to keep them healthy. Houseplants only need half as much water and fertilizer during the winter, so adjust your routine accordingly. Water plants early enough in the day that their leaves have dried before nightfall. Spider mites: Watch out for spider mites, creepy crawlies attracted to houseplants. Check for webbing on the undersides of leaves, bases of stems, and new buds. If spider mites appear on large plants, put them in the shower repeatedly, cleaning them with streams of water. Smaller plants can be held upside down and swirled around gently in soapy water. Evergreen decorations: Decorations made of evergreen are beautiful and seasonally appropriate, but they can damage your home if you don’t pay attention. Evergreens secrete sap, which is harmful to finished wood surfaces. It’s better to be safe than sorry, so make sure that evergreen décor and wood surfaces are separated by materials like parchment, colorful felt, or fabric. Gardening gifts: Give the joy of gardening this holiday season! Share your hobby with loved ones via gifts like books, gloves, tools, weather instruments, and decorative pots. Encourage a novice or thrill an expert with great accessories for gardening. Yard maintenance: It may be hard to take a break from indoor festivities in December, but your yard may need some attention this month. Vulnerable perennials should be covered so they aren’t damaged in extreme weather. Try to avoid walking on too much frozen grass before it’s snowed, however. The less pressure applied to a frozen yard during the winter, the better it will look in the spring. Foot traffic can break grass blades, unless they’re covered with snow. While on that topic, keep salty roadside snow from drifting into your yard. Finally, tap trees gently if you want to remove snow, but allow ice to melt naturally; branches break easily. Birds: Attract welcome visitors to your yard with snacks. It’s fun to watch birds enjoy a winter garden from the comfort of your warm home. Well-stocked bird feeders aren’t the only way to keep them around. A Christmas tree can be relocated in the yard and redecorated with presents for wildlife. Birds love popcorn and cranberry garlands as much as people do. Use up leftover seasonal treats by pushing them into the tree canopy; options include apples, oranges, leftover breads and pine cones covered with peanut butter and birdseed. Recycle Christmas trees: You’ve enjoyed your Christmas tree throughout the holiday season and so have the birds. Take advantage of its natural resources by reusing the evergreen’s parts. Branches make for great barriers to protect perennials from the elements. Once the weather warms back up, they can serve yet another use; chipped and shredded limbs make great mulch. Lastly, chop and season the trunk for convenient firewood next winter.